In the past, information technology in itself was not considered a strategic driver in most chemical company business plans. Rather, it was relegated to being a prudent tactical element for continuous business improvement and back office cost reduction. As information technologies and hardware developments (such as sensing, metering, mobility, miniaturization, etc.) progress and converge, a new strategic imperative is emerging—Digitalization. Digitalization is rising as a strategic imperative for both reactive and proactive reasons. Reactive reasons fall under the need for continuous cost improvement, safety and speed; proactive reasons include harnessing new possibilities in customer interaction (i.e., new business), talent management and business analytics/prediction/decision-making. The rapidly changing chemicals competitive landscape is also driving the adoption of new solutions. Some trends reshaping chemical investment and trade patterns include: Huge new capacity investment in North America (and the customer interaction and distribution disruptions it causes, see past blog); competitive pressures and poor economic growth in Europe; constraints on gas feedstocks in the Middle East; slower growth in China; and increases in automation across industries globally, changing the basis of competition in fabrication/assembly industries (traditional chemical customer industries). These disruptive trends demand that chemical companies be radically smarter about how they manage their value chains, including customer prospecting and interaction, materials procurement, plant operations, asset maintenance and product shipping. The availability of data across company value chains has reached an unprecedented level and harnessing this wealth of data for improving operations and acquiring new customers holds considerable value. The digital field is truly expansive and interconnected. It can be argued that employing digitalization as a strategic imperative has risen to the level of gaining competitive advantage equivalent to or more important than, for instance, employing the best manufacturing process technology for a given chemical product. 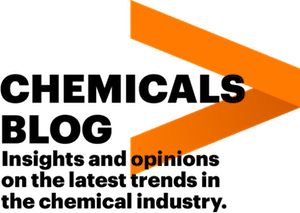 The importance of digitalization to chemical company performance can be substantiated by the association of performance with digitalization. Each year we update our high performance business (HPB) scorecards for the global chemical industry in order to ensure that we have a sound foundation for understanding where to find best practices, such as in last year’s research on “Chemicals in transition.” The HPB scorecard includes chemical company rankings on various financial metrics, covering long term performance, flexibility, operational excellence and growth & innovation (also including non-financial measures, such as patent metrics). We compared these results to each company’s performance on a digital index comprised of metrics related to digital strategy, customer servicing and operations enablement. 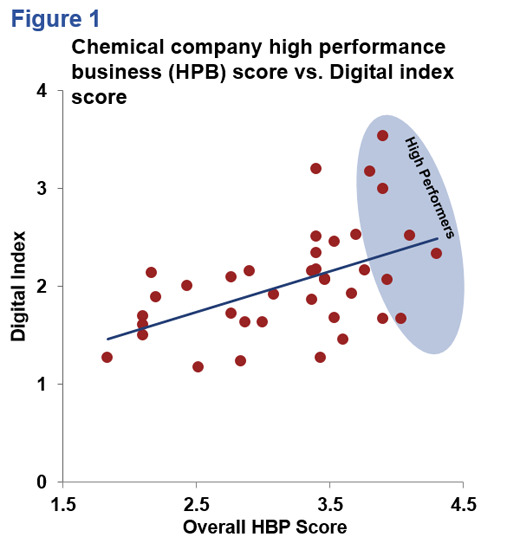 The relationship of the HPB score and the digital index score is shown in Figure 1 and demonstrates that high performing organizations leverage digital technologies to a greater extent than their peers. 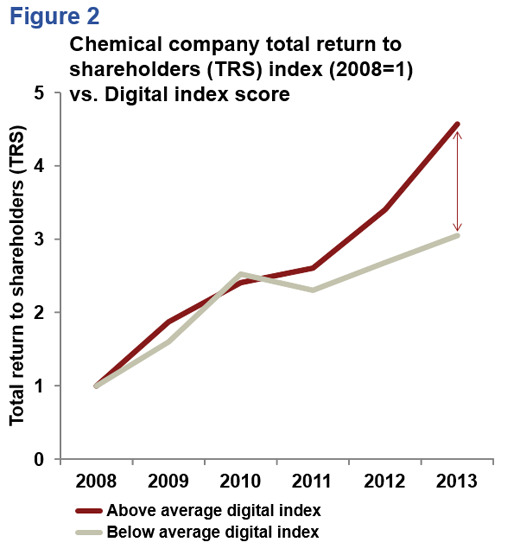 Total return to shareholder (TRS) comparisons also bear this out, with those companies scoring above average on digitalization having greater TRS, as shown in Figure 2. 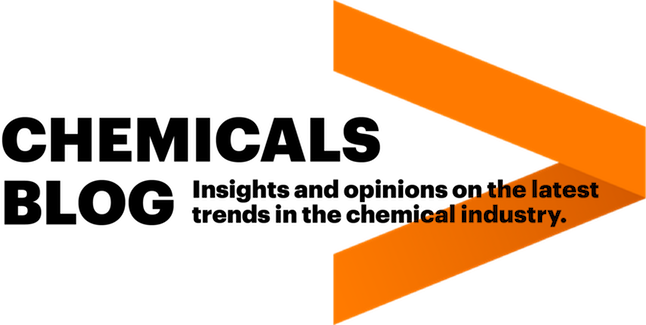 So what distinct practices are high performing chemical companies doing vis-à-vis digitalization? Our current research indicates that high performers build or acquire technologies to increase and/or improve customer interaction and operations. 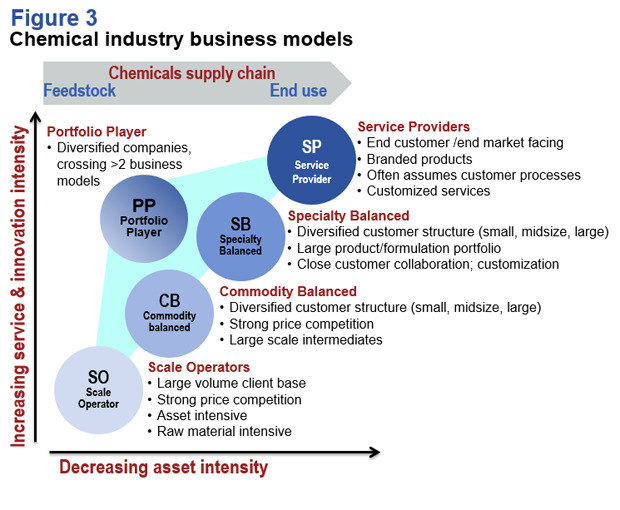 It is particularly clear to see this in chemical companies with business models closer to customer end markets, where providing customized needs are essential, such as in specialty gases or agricultural chemicals, falling under our “service provider” business model in Figure 3. Leading companies here also provide on-line service activities and employ digital communications and marketing. As an example of online service activities, in water treatment chemicals, service providers can monitor water conditions at customer locations remotely to ensure that chemicals and equipment are functioning properly. In the case of digital communication and marketing, early adopters are putting in place organizations to support creative and marketing services along with leading digital asset management and online ordering tools. Digitalized processes are not always about “big data” from the internet. Digitalized processes also use internal company data captured through multiple systems and platforms to boost R&D results, safety, maintenance and productivity. These systems are combining the strengths of mobility, sensing, and advanced analytics to tackle business problems in new ways and create value for customers. For instance, remote vibrational monitoring of equipment can predict needed maintenance. Similarly, advanced surveillance systems can improve plant safety, as well as security from outside threats. Clearly, chemical companies must open their thinking to new paths of value creation involving digitalized systems. The data may already be available, just waiting to be channelled for creating advantage. We will be expounding on this further in upcoming blogs.